Tim R. Westerberg served as a school principal for 26 years, the last 20 of which were at Littleton High School in Colorado. Prior to entering school administration, he taught social studies and coached in Illinois and Iowa. He currently lives in Dillon, Colorado, and works nationally and internationally as a school improvement coach. He served on the NASSP/Carnegie Foundation Commission on the Restructuring of the American High School, which produced the seminal report Breaking Ranks: Changing an American Institution, and he played a significant role in the development of Breaking Ranks II, which was released in 2004. Other professional activities include serving as a member of ASCD's The Art and Science of Teaching professional development faculty, president of the Colorado Association of School Executives, member of the Colorado Commission for High School Improvement, and executive director of the Alliance for Quality Teaching. Westerberg was one of four finalists for the NASSP/Met Life Principal of the Year program in 1994 and received the Honor Administrator Award from the Colorado Music Educators Association in 1998 and the Department Service Award from the Colorado Association of Secondary School Principals in 1999. 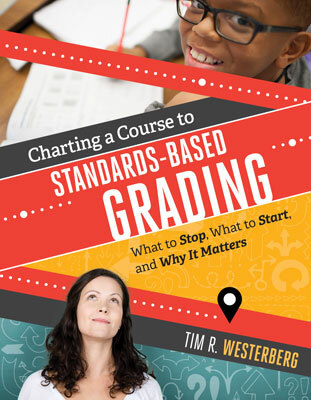 Tim R. Westerberg guides educators to four key destinations on the road to improved grading and assessment.